A serious and compassionate Keyblade wielder, she is always worrying about her closest friends, Terra and Ven, and is generally the most responsible between the three of them. She is absolutely devoted to her friends, always ready and willing to fight for them and later even sacrificing herself for them. She is a modest character, putting others before herself and referring to herself nearly always as a trainee, despite gaining the rank of Keyblade Master early on in Birth by Sleep. The night before her and Terra's Mark of Mastery exam, Aqua perceives that whatever the outcome of the trial - provided one if not both of them are successful - the trio that she, Terra and Ven form will be split up as they go their separate ways on assigned missions. To keep the three of them linked in spite of separation, she fashions three lucky charms based on the shape of a destiny-joining fruit. This eventuality of separation proves inevitable when Aqua succeeds in passing the exam, though Terra fails. The latter is sent on a mission to track down the missing Master Xehanort and quash the Unversed threat, with Ven departing on his own adventure without Eraqus' permission. Aqua is tasked by Master Eraqus with keeping an eye on Terra in the event his darkness overcomes him while also tracking down Ven and returning him to the Land of Departure. Aqua's journey across a variety of worlds sees her always on the tail of Ven and Terra, though she is never able to catch up to them fully. During her travels, she disbelievingly hears of the acts committed by Terra, which force her onwards, remembering Eraqus wish that should Terra fall too far into darkness, she was to bring him home. Later in her journey, she finds herself in Radiant Garden where she meets another Keyblade wielder - King Mickey - and with his help defends a young girl with a heart of pure light, Kairi, from the unversed that are intent on kidnapping her. During a lull in the battle, Kairi touches Aqua's Keyblade, performing an impromptu Keyblade Inheritance Ceremony. In return for protecting her, Kairi gives Aqua flowers which becomes the keychain Destiny's Embrace - a Keyblade that Kairi appears to wield during the concluding events of Kingdom Hearts II. Later on in Radiant Garden Aqua finds Ven and Terra, though their reunion is short-lived and far from happy. After the defeat of a massive Unversed, Terra and Aqua engage in a heated argument about Master Eraqus' orders, with it being revealed that Aqua was sent to essentially spy on Terra. Deeply hurt, Terra leaves as Ven scolds Aqua, telling her that her status as new status as Keyblade Master has got to her head. Afterwards, Aqua visits Merlin in his house and in the town square runs into Vanitas, who taunts her by asking about Ven and if he's managed to get any stronger. When Aqua asks for him to explain himself, he attacks and the two engage in battle, with Aqua emerging victorious, though Vanitas simply leaves via a Corridor of Darkness, cryptically commenting that Aqua is his ‘backup plan'. After the battle, Ven arrives and asks to accompany Aqua, though he refuses, telling him to return home before she departs. In Neverland, Aqua meets Peter Pan and the Lost Boys and is led to their treasure chest, containing their most valuable possessions. Inside, Aqua finds Ven's wooden Keyblade - a training gift from Terra - before she feels a strange presence nearby and goes to investigate. She finds Vanitas once more, this time in possession of the wooden Keyblade, which he breaks to antagonise Aqua, and the two battle once more, with Aqua again victorious, though is exhausted by the effort. After recovering, she continues her journey across more worlds until she comes to Destiny Islands, some time after Terra was there. She finds a young Sora and Riku, like Terra did, and confides in the former to help Riku should he ever fall into darkness. Though initially deciding to grant Sora the ability to later wield a Keyblade, she notices that Terra has already done the same to Riku, and thus changes her mind - not wanting to risk both boys undergoing the struggles that she and her dear friends have been through. Afterwards she finds Mickey, unconscious and drifting in space, whom she immediately takes to the Mysterious Tower, where Yen Sid reveals to her that Eraqus has been killed at the hands of Terra and Master Xehanort. Stricken by the news, when she hears from Yen Sid that the two are heading to the Keyblade Graveyard, she heads there as well. Once there, she meets up with Terra and Aqua, the former promising that he will no longer be led astray by his darkness or Master Xehanort's attempts to manipulate him, swearing revenge on the man for all that he has done. Aqua reminds him that darkness is based on the very anger and rage which he intends to use against Master Xehanort and that if Terra continues to fight with them, then the corrupt Keyblade Master has already beaten him. As the battle heats up, Ven's sneak attack on Master Xehanort backfires, the old man grabbing Ven and encasing him in ice before dropping him off a cliff. At ground level, Aqua is able to catch him, but when attempting to hasten his recovery she is confronted by Braig, who is enraged at Master Xehanort for not only scarring his face, but using as nothing more than a tool. After Aqua defeats Braig, she is knocked out by Vanitas and later woken up by Mickey when it is shown that Ven is possessed by Vanitas and now wields the χ-blade. Vanitas begins telling Aqua about his plan to use the legendary weapon to unlock Kingdom Hearts and re-enact the Keyblade War, with Aqua's reaction being to command silence of him before engaging him in battle one last time. Simultaneously, Ven fights for control over Vanitas in his Dive to the Heart, with both the external and internal battles being won by Ven and Aqua at the same time, purging Vanitas from Ven and destroying him, which also results in Ven entering a comatose state. At the same time, the χ-blade is destroyed in an explosion of light that ejects the remaining combatants from the world. Mickey takes Aqua and Ven to Yen Sid's tower, with the old man sadly informing them that Ven's heart has left his body entirely. Unsure of any way to recover Ven's heart, Aqua is told by Yen Sid to continue believing in their friendship, as it may some day return his heart. She takes Ven to the Land of Departure and places him upon a throne within the central castle. Then, she uses Eraqus' Keyblade and the last of the Keyblade Master's power to seal the heart of the world away from darkness, transforming it into Castle Oblivion. Pursuing what remains of her last friend, Aqua track the possessed Terra to Radiant Garden, where she fights him and is unable to return him to his senses. The internal struggle between Xehanort and Terra continues however, and Xehanort uses his Keyblade to unlock his heart a second time in an attempt to remove Terra fully, though it results in Xehanort losing all his memories. As Terra-Xehanort falls through a portal into the Realm of Darkness, Aqua dives after him but soon realises she will be unable to save both Terra and herself. She sacrifices her Keyblade and armour to save what remains of her friend, returning him to the Realm of Light. Stuck in the Realm of Darkness, when attacked by several powerful Heartless Aqua decides to simply allow them to destroy her, but she is saved when Terra and Ven's Keyblades appear out of the darkness, slaying her attackers. Reminded that her friends are still with her, she pushes on and finds a portal of light opening in the darkened sky, only for a column of darkness to rise up and smash through the opening. After fighting off more Heartless, Aqua emerges in a clearing to look out and see the Castle of Dreams shrouded by clouds of darkness. While her time is spent in the Realm of Darkness, Aqua's Keyblade and armour is found alongside Terra-Xehanort, who is found by Ansem the Wise and his apprentices. The armour is carried away and later placed in the Chamber or Repose, a place Xemnas later shows particular interest in, spending much time apparently conversing with someone in there that he calls a ‘friend'. Following the events of Kingdom Hearts II, Aqua arrives at the Dark Margin where she meets Ansem the Wise, who survived the explosion of his Kingdom Hearts encoding device. He tells her it's been almost eleven years in the Realm of Light since she's been gone and explains the events that have unfolded in her absence, with particular focus on Sora. Trusting that Sora will rescue both her and her friends, she utters the boy's name as a tear rolls down her face, filled with renewed hope. Her intelligence is only outshone by her kind and gentle spirit and unyielding belief in the light, Aqua was one of three Keyblade apprentices hailing from the Land of Departure. Between herself and Terra, she was the only one to claim the true title of Keyblade Master, but that title was rendered useless as she failed to protect her friends from Xehanort, even falling into the Realm of Darkness herself, never to be seen again. Aqua appears to Sora in the depths of his dreams, calling out for Ven. The real Keyblade Master still waits in the Dark Margin for the boy who will lift her and her friends out of their suffering. 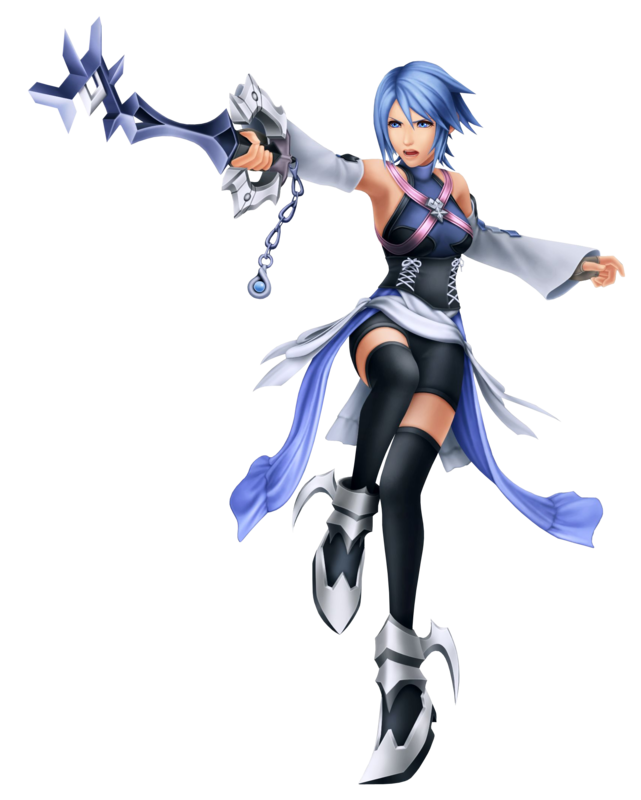 A Keyblade Master hailing from the Land of Departure, Aqua is one of three Keyblade wielders whose fate was tragically altered by Xehanort. Left in the realm of darkness, Aqua pushes through forgotten worlds as she searches for a way to reunite with her friends, Terra and Ventus. Fighting through her own manifestations of doubt and uncertainty, Aqua reunites with her friend Mickey. Together, the two find their way to the Destiny Islands, and with it the Dark World's Keyblade. Although Mickey was successful in locking the open Door to Kingdom Hearts, the Devil's Swarm pushed Aqua back into the Dark World. There, she resolves to be a guide to anyone who finds themselves lost in darkness. While she waits in the Dark Margin alongside Ansem the Wise, Mickey and Riku prepare to rescue her once and for all from the darkness.